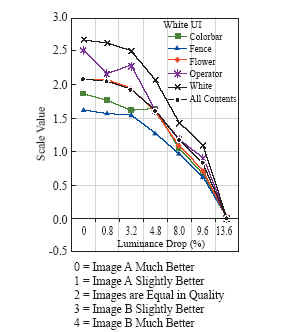 The lifetime of an OLED is usually calculated as the time it takes for the luminance to decay to half the initial luminance; however, does this calculation fit the actual use case? The answer is no. According to the mobile phone manufacturer Nokia in the 2007 Society for Information Display (SID), the company changed the mobile phone panel to OLED display, and through six different display patterns, through the actual human eye for picture quality. The sensitivity of the brightness decay and burn in phenomenon caused by the operation time is evaluated. 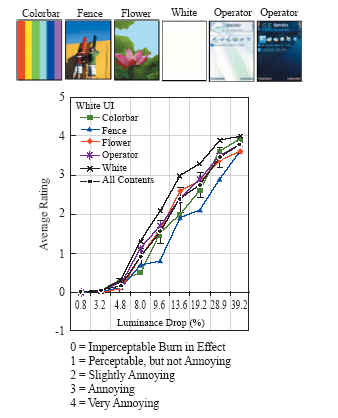 It is found that when the brightness of the picture is more than 5%, the human eye can judge the difference between the picture and the original; when the brightness of the picture is attenuated by 10%, the human eye has begun to produce annoying feelings for the picture, as shown in Figure 1. If the above method is regarded as the OLED life testing standard, based on the "time required for 5% brightness reduction", the OLED lifetime still needs a lot of breakthrough and growth. This article will organize and discuss the mechanisms that affect the aging of OLEDs and the ways to improve them. Factors that affect the decay of OLED lifetime can be distinguished as both intrinsic and extrinsic. The so-called extrinsic factor means that the lifetime degradation of the OLED is not related to the structure of the OLED itself or the organic materials used. The largest source of external factors is water oxygen in the environment. Since the organic materials in the OLED and the highly active metal cathode are sensitive to water and oxygen in the environment, the eroded position presents a black spot that does not emit light when the OLED is energized. And the black dots will gradually become larger as time goes by, making the area of â€‹â€‹true luminescence smaller and smaller, causing the OLED brightness to decline. The most direct and effective way to improve the growth of black spots in OLED components is through good packaging and desiccant with hygroscopic ability. Table 1 lists the expected gain effects of various methods for improving OLED lifetime. When the growth source of the black spots of the OLED component can be completely suppressed, however, it can still be found that the brightness of the OLED is still degraded as the operation time increases. Such a decay mechanism is blamed on the structure of the OLED itself or on the organic materials used. Therefore, these are called intrinsic factors. The mechanism of studying intrinsic factors is much more complicated, and it is impossible to explain all the recession phenomena with a single mechanism. Below we will be divided into two aspects of organic materials and component structure to explore the intrinsic factors affecting the phenomenon and improvement of OLED life decline. 1. Stable organic materials (1). Thermal stability: Thermal stability means that the organic material itself needs to have a high glass transition temperature and a high thermal cracking temperature. This is because in the OLED fabrication process, the organic film layer is formed by thermal evaporation, so the organic film layer just evaporated on the substrate is mostly in an amorphous state; however, for some low glass transition temperature organic materials. In other words, it is susceptible to the temperature of the operating environment or the Joule Heating generated inside the OLED module, which induces the crystalline layer to be formed, which will change the original physical properties of the organic material, thereby causing the brightness of the OLED to decline. phenomenon. (2). Electrical and photoexcitation (redox) stability: In a multilayer OLED module, theoretically, only hole carriers are transported in the hole transport layer, and only electron carriers are present in the electron transport layer. Passed therein; however, for the luminescent layer, both electron and hole carriers are present therein. Therefore, as an organic material of the light-emitting layer, it is particularly important for the stability of electrical and photoexcitation, or whether the positively or negatively charged ionic species are stable. As for how to select an organic material that is stable to light or electricity, it can be identified by periodically observing the redox characteristics of organic materials by cyclic voltammetry (CV). (3). Purity of organic materials: The purity of organic materials is regarded as one of the most important conditions for judging whether organic materials can be used for OLEDs. However, it is one of the most easily overlooked problems. Universal Display Corporation (UDC), a leader in the development of phosphorescent materials, measured the lifetime of OLEDs for the different purity of its red phosphorescent guest materials (RD07) and found that organic materials of different purity have a considerable impact on lifetime. However, each instrument that identifies organic purity has its limits, so it is necessary to perform repeated purification of organic materials before the OLED module is fabricated. How to remove trace ions present in organic materials is also very important. . In the OLED module, the electrode used and the organic material are completely different species, and there is a problem that adhesion is poor between them. In addition, the indium tin oxide (ITO) anode electrode and the metal cathode electrode used also have some degree of difference in energy level between the commonly used hole transport layer material and the electron transport layer material. 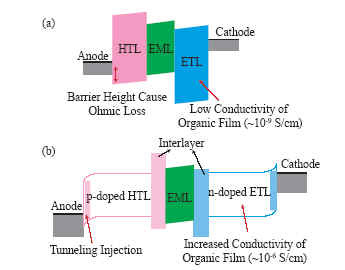 Therefore, what kind of effective electrode surface modification or which appropriate buffer layer material is selected for the interface between the electrode and the organic layer is not only one of the keys to improving the luminous efficiency of the component but also improving the lifetime of the OLED. (1). Lowering the energy level difference: In 1995, C. Adachi et al. used 14 kinds of hole transport layer materials with different ionization potentials (Ip) to investigate the energy difference between them and the ITO anode. The relationship between life decline. It can be found from the experimental results that there is a great dependence between the energy level difference and the lifetime degradation of the OLED. The smaller the energy level difference between the electrode and the organic layer, the longer the lifetime of the OLED. In addition to the important energy level difference between the anode and the hole transport layer interface, the interface energy difference between the metal cathode and the electron transport layer is also important. When the energy barrier of electron transport between the electron transport layer (ETL) and the light-emitting layer (EML) is improved, the lifetime of the OLED as a whole can be effectively improved; in addition, the energy barrier of electron injection between the electron injection layer (EIL) and the metal cathode can be improved. Effectively improve the early decline of OLED life. (2). Forming a quasi-ohmic contact: In recent years, many studies have focused on OLED components. The so-called p is to use molecules with electron-trapping properties to be doped into the hole transport layer material; And n is a molecule having a push-electron property, which is doped in the electron transport layer material. Through such doping, band-bending can be caused between the electrode and the p or n-type carrier transport layer interface, as shown in FIG. 3, so that holes and electron carriers can be tunneled. ) way to form an approximate ohm interface. Such a method is also equivalent to the above mentioned, reducing the interface energy difference between the electrode and the organic layer, and effectively improving the life of the OLED. (3). Surface modification of the electrode: other properties of improving the interface between the electrode and the organic layer, the surface of the ITO electrode can be treated by plasma through oxygen, or the surface of the ITO electrode can be treated by plasma of CHF gas, or the polymer can be used. The conductive film poly(3,4-ethylenedioxythiophene)/poly(styrene) (PEDOT/PSS) is applied at the interface between the ITO electrode and the organic layer by spin coating to improve the work function of the ITO electrode or to prevent the diffusion of indium ions in the ITO electrode. In the luminescent layer, or to improve the surface roughness of the ITO electrode, etc., thereby improving the life of the OLED component. These super bright LED Camping Light and U-Tube Camping light is very easy to operate to make camping romantic and light. We do with dry battery camping lantern and AC/DC rechargeable camping lantern with good quality ,so that make camping night very nice.